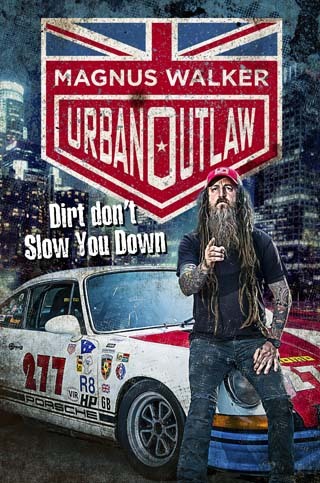 Urban Outlaw - Dirt Don't Slow You Down by Magnus Walker – Book Review. Liam Bird on the autobiography of one of life's true motoring mavericks. “I’m pretty sure that if you’re reading my book, then you probably like cars. There’s also a pretty good chance that you are a Porsche fan”. That’s how Magnus Walker opens Chapter 12 of his autobiography Urban Outlaw: Dirt Don’t Slow You Down before going on to say: “So, if you don’t like cars or Porsches, I suggest you skip on ahead”. Chapter 12 incidentally is entitled: ‘A Hobby That Got Out of Control’, and if you take his advice there are only chapters 13 and 14 left to read. I suspect that like so many of you, I became aware of Magnus Walker as a result of my liking for Porsche 911s, and through social media. ‘Urban Outlaw’ is the title of a thirty-two-minute documentary film made by a Canadian called Tamir Moscovici that I first saw on YouTube. In it a heavily tattooed man with dreadlocks talks about his obsession with Porsche’s rear-engined icon: The 911. He then goes on to say, in a hybrid American-Yorkshire accent, that he’s owned over 50 of them (Git!). How, exactly? Written as if Walker himself is answering those kind of questions, and indeed asking himself similar ones, Urban Outlaw: Dirt Don’t Slow You Down is the story of a man who left school in 1980’s Sheffield with virtually no qualifications to his name and ended-up in living in a film set warehouse in downtown L.A. surrounded by Porsches. He’s very much stamped his own identity on both. 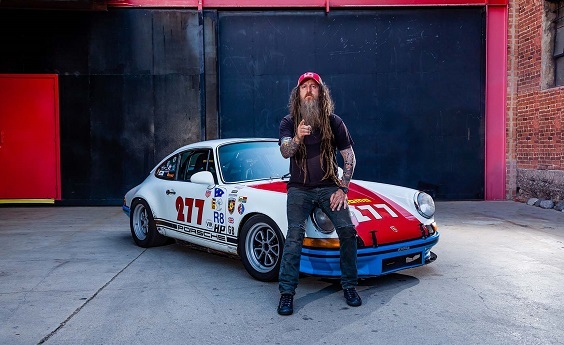 After labouring on building sites, working as a swimming instructor, and picking-up his mother’s ability to sew, Magnus Walker applied for a placement on Camp America. It changed his life. After scraping enough dollars together to get the Trailways bus from Detroit to Los Angeles, Walker ended-up virtually penniless in Union Station at 4am. Cut a long story short (as Walker likes to say – a lot), and after modifying a pair of $9.99 PVC trousers with a home sewing kit in his room at the YMCA, Magnus finds himself selling them for $25.99, plus another eight pairs besides. It’s the start of something, or at least it should be. Four months of sofa-surfing later and we’re back in Sheffield, the American dream apparently over. In 1987, with just four days’ notice, and after initially being rejected, another chance to join Camp America arises. Needless to say it’s grabbed with both hands. After working the summer as lifeguard in New Jersey the Urban Outlaw saves up enough cash to get another bus ticket to L.A. The contacts he made there the first time around let him sleep on their sofas again and out comes the sewing kit. A $10 day job on Venice Beach eventually turns into a fashion empire that clothes the likes of the New York Dolls, Faster Pussycat, The Cars (no puns intended), Madonna and Alice Cooper. A stall selling customised second-hand Levis eventually turns in to the Serious Clothing brand. Serious Clothing buys a dilapidated warehouse in downtown L.A. The people who buy Serious Clothing ask if they could film their videos there. Grit and determination – 16 hour days and sleeping rough – plus, the reader suspects, large doses of both luck, judgement, and simply being in the right place at the right time are all involved. It is a trip to the Earl’s Court Motorshow in 1977 that has Walker hooked, but it isn’t until 1992 that he has the funds in order to purchase one. In true Magnus style, that car needs a little bit of work – something he’s never been afraid of – and needless to say, just like those second-hand Levis, a little cosmetic alteration and enhancement too. One modified 911 turns in to another, and then another. Porsche Passion began. The Hobby That Got Out of Control. Through word of mouth, the very beginning of internet blogs, and the Porsche Owner’s Club, Magnus Walker’s personalised Porsches develop a following all of their own, and just like his clothing line, now sell (if you can get him to release one from his collection that is) to the rich and famous. They’re probably what he’s most famous for. Labourer, lifeguard, teacher, tailor, self-taught mechanic, serial entrepreneur, now motivational speaker, and above all else Urban Outlaw. Magnus Walker is one of life’s originals; a man who followed his own path and “stayed ahead of the curve”. Whether you like Porsches or not, it’s an inspirational story that deserves to be read without ever once having to skip ahead.